The case could tenuously be made that many of the Futurists’ areas of interest were dictated etymologically by the overuse of the word macchina in the Italian language. The idolisation of the machine was a central tenet of their desire to sweep away the past; as coincidence would have it, a number of the trappings of modernity are much more mechanistic in Italian. The Futurists’ love of speed and racing cars surely gained added impetus from the fact that a car is la macchina. Their experimentation with typography is linked to their beloved machinery by a typewriter being a macchina da scrivere; the act of going to press is andare in macchina. And the use of photography becomes far more Futurist, and futuristic, when a camera is referred to as a macchina fotografica. The challenge of Futurist photography was how to impart the exalted dynamism of light and motion into even completely still objects. Long exposures could record the progress of moving objects in a single image, but what if the object was static? What if the subject was not only motionless, but also staid and unFuturist – like the mouldering buildings of the Italian capital? One answer was the use of the aeroplane, another of the machines fetishised by the group (literally the case in a 1939 collage by Bruno Munari, And Thus We Would Set About Seeking an Aeroplane Woman, which depicts two mermaids of the skies – half pinup, half fuselage). Filippo Masoero – later to work in aerial reconnaissance during Mussolini’s Abyssinian campaign – transformed the Roman Forum from a crumbling relic, a Calvary of crucified dreams (as Marinetti would have put it), into a dynamic, Futurist landscape. 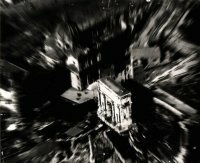 He achieved this by photographing it from the air, using a prolonged exposure during the plane’s descent; the immobile buildings blur and warp, like stars viewed on a science-fiction journey into hyperspace. “We must invent and rebuild the Futurist city like an immense an tumultuous shipyard, agile, mobile and dynamic in every detail,” says Antonio Sant’Elia’s 1914 Manifesto of Futurist Architecture, adding (a decade before Le Corbusier): “The Futurist house must be like a gigantic machine.” In practice, few Futurist buildings ever existed, although the principles of the manifesto lived on in Brutalism. But one that was constructed was Fortunato Depero’s book pavilion for 1927’s International Exhibition of Decorative Art, in Monza. Looking like a hybrid of Buster Keaton and Il Duce, Depero was active in a wide range of disciplines, including painting, photography, theatre and the applied arts. Among his endeavours were the robotic ballet Anihccam del 3000 (that word again, backwards); various projects involving marionettes; and a book fastened together with a pair of steel bolts. His book pavilion ignores the architecture manifesto’s stricture that “the decorative must be abolished”; it is a Mayan temple in miniature, with huge totem poles of letters bearing the names of publishing houses. These fascistic letters resemble blocks of type, and embody the Futurist credo of “words in freedom” – that print should not be restricted by typographical convention, but free to roam across the page in new, daring ways. In Depero’s book pavilion, the words are freed from the page itself to stand proud, cast in concrete.